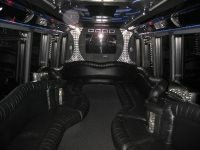 This is the limo bus that was created for the Pittsburgh Party scene … a 28 to 30 passenger limo party bus complete with everything that you need. There are mirrors on the ceilings and wet bars between the seats. Strobe lights, neon lights, dance pole and plenty of room to stand on your feet. This Pittsburgh Limousine Party Bus is long and sleek; our ultimate party machine .